Several hundred faculty had signed a letter saying University of Southern California President C.L. Max Nikias had "lost the moral authority to lead." The most recent scandal involves a former campus gynecologist, Dr. George Tyndall, who is alleged to have made sexual comments and inappropriately touched patients during pelvic exams. More than 300 people, including many former student patients, reported his misconduct dating back to the early 1990s. "Tyndall routinely made crude comments, took inappropriate photographs and forced plaintiffs to strip naked and groped them under the guise of medical treatment for his 'sexual gratification,' according to civil lawsuits filed this week. "At least a dozen lawsuits have been filed so far and police are interviewing alleged victims to see if any crime was committed." The university's internal investigation determined many allegations were true and Tyndall was allowed to resign, but USC administrators did not report the incident to the Medical Board of California, nor did they notify the patients. As a result of that and other scandals, several hundred faculty signed a letter saying Nikias had "lost the moral authority to lead." The board of trustees did not say when Nikias would leave his post. Earlier this week, the board of trustees had issued a statement saying that while it is "deeply troubled by distressing reports about Dr. George Tyndall," it still has "full confidence" in Nikias' leadership. 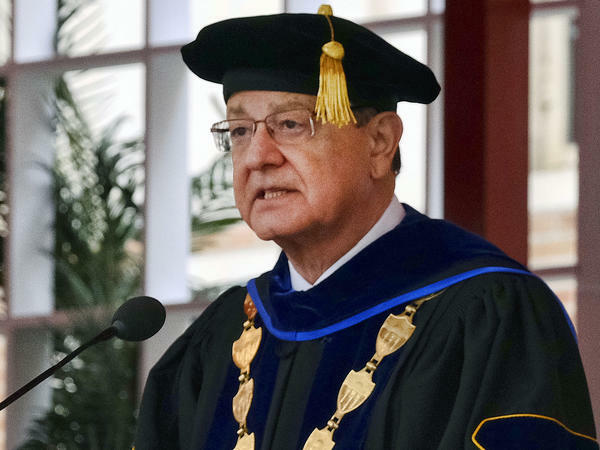 Nikias has been a prolific fundraiser during his eight-year tenure as USC president. The Los Angeles Times, whose reporting uncovered the complaints about Tyndall, detailed Nikias' accomplishments. "The cornerstone of Nikias' legacy is a $6-billion campaign launched in 2011, then described as the largest such drive in academic history. The university collected gifts and pledges to surpass the goal about 18 months ahead of schedule, according to USC. For his 'exceptional progress' in the $6-billion campaign, trustees awarded Nikias a one-time $1.5-million bonus three years ago, making him the third-highest paid college president in the nation that year." But Nikias' handling of the Tyndall scandal and other controversies, including misconduct by two former medical school deans, one of whom led a double life using drugs and partying with addicts and prostitutes, led to mounting pressure for the board of trustees to take action.